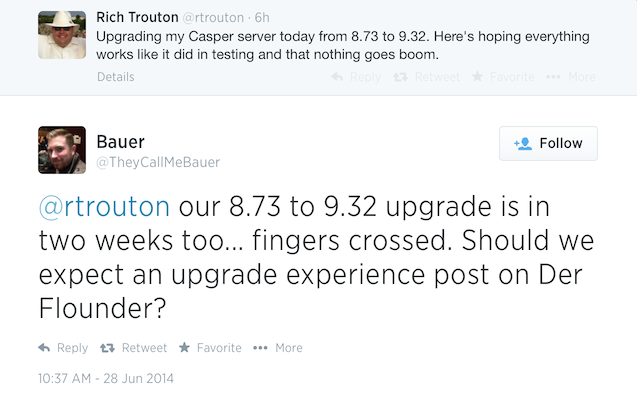 Since Casper 9.x was first released, I’ve been preparing for my shop’s own upgrade from Casper 8.x to 9.x. As of the morning of Saturday, June 28th, those preparations have ended with my shop’s successful upgrade to Casper 9.32. When I mentioned this on Twitter, I heard from a few folks who mentioned that they were planning to also do this in the near future and @theycallmebauer asked if I was going to post about my experience. I thought that was a good idea, so please see below the jump for the details. One of the more interesting functions in Apple’s fdesetup tool is the authrestart verb, which allows a FileVault 2-encrypted Mac to restart and bypass the FileVault 2 pre-boot login screen. Instead, the Mac reboots as a unlocked system and goes straight to the regular login window. When you run the fdesetup authrestart command, it asks for a password or a personal recovery key. The password must be an account that has been enabled for FileVault 2 (i.e. an account that shows up at the FileVault 2 pre-boot login screen.) After that, it puts an unlock key in system memory and reboots. On reboot, the reboot process automatically clears the unlock key from memory. You would store either the password of an existing FileVault 2-enabled user or the existing personal recovery key in the Password key in the plist. Once the plist has been set up and properly formatted, run the following command to run the authrestart process and reference the password or recovery key in the plist file for authentication. The man page for fdesetup also indicates that you can use a keychain with both the private and public keys associated with an institutional recovery key to authenticate the authrestart process. Based on the manpage, you should be able to run the following command to run the authrestart process and reference the institutional recovery key for authentication. As of OS X 10.9.3, this does not appear to work. Instead of being prompted for the keychain’s password and the Mac restarting, an Error: Unable to restart message is displayed and nothing else happens. 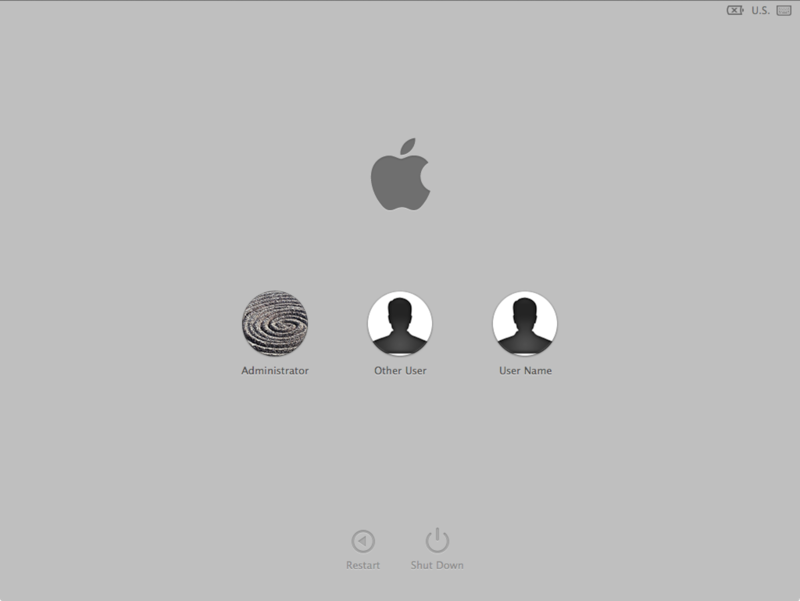 If manually restarted, the Mac will reboot to the FileVault 2 pre-boot login screen. I’ll be collaborating with my colleague Jeremy Reichman to give a session at the Penn State MacAdmins Conference 2014, which is being held from July 8th – 11th, 2013 in State College. For those interested, our talk will be on Friday, July 11th. For a description of what we’ll be talking about, please see the Extending OS X Management Systems with Scripting session description. You can see the whole list of speakers here on the Sessions page. I’ll be speaking about FileVault 2 at the Penn State MacAdmins Conference 2014, which is being held from July 8th – 11th, 2013 in State College. For those interested, my talk will be on Thursday, July 10th. For a description of what I’ll be talking about, please see the Managing Mavericks’ FileVault 2 with fdesetup session description. You can see the whole list of speakers here on the Sessions page. UPDATE – 9-22-2014: JAMF brought back the jamf mdm command in Casper 9.4, so it’s possible to use the workflow described in this post in Casper 9.4 and later. The issue I ran into is that jamf manage waits until all policies are finished running, which meant that the MDM fix is running after the jamf recon command completes its inventory update and sends it on to the Casper server. The consequence is that the Casper server would never be informed that the machine had actually been fixed, which potentially cues an infinite loop of fixing a problem which is already fixed. 1. I wanted to fix my problem with a Casper smart group that would contain only affected machines and an associated Casper policy that would fix the machines in the smart group. This would allow the problem to be automatically detected and then fixed without the need for human intervention. 2. I needed to make reasonably sure all policies were finished running before trying to run the jamf manage command. Otherwise, running jamf manage would result in the recon running before the MDM certificate gets fixed. On top of that, I preferred that jamf manage only be run once rather than building a process that potentially ran it a large number of times. A) I wanted to fix the problem automatically with a Casper policy. B) I couldn’t directly fix this with a Casper policy. Running the commands above using a policy would mean that jamf manage and jamf recon would not run in the order I wanted them to, with the undesired “infinite loop” consequences described above. Shea Craig gave me the idea of using a LaunchDaemon and script to run the commands I needed, but I still needed a reliable way of determining if Casper policies were running. Shea’s approach relies on killing the jamf process as needed, but that ran the risk of interrupting any active policies or other tasks that were running. After mulling over the problem for a while, I thought of another way to determine if a policy was running. /var/log/jamf.log is updated when Casper policies or check-ins run on an individual Mac, so if the log hasn’t been updated in a while, it is very unlikely that a policy is running. 1. Verify that the Mac can contact the Casper server. 2. Verify that /var/log/jamf.log has not been written to in the past five minutes. 3. If /var/log/jamf.log has not been written to in the past five minutes, fix the MDM certificate and communicate that it is fixed to the Casper server. 4. Delete itself and its associated launchdaemon. For the details, see below the jump. Back when Apple Remote Desktop 1.2 (ARD) was the main tool I used to administer my Macs remotely, I wanted to be able to run Unix commands remotely but needed a delivery vehicle that could send them over ARD. Payload-free installer packages were the answer. Installer packages are Apple’s preferred way to install software. Apple built into ARD the ability to install software on remote machines using the Install Packages… function. One useful feature of installer packages is that you can have them run a script before or after the package is installed. You can even set up a number of scripts and have them run in the order you designate. Best of all, you can build a payload-free installer package that run scripts but does not install files. So, when I needed to run a Unix command on one or more of my managed Macs, I’d normally build a payload-free package and use the Install Packages… function to push it out to the relevant machines. 1. Ease of use – Running a script contained within a payload-free package does not require any special knowledge or training. All the person using it has to know is how to run an installation using an installer package. 2. Portability – When my management methods evolved beyond using ARD as my primary management tool, I found that different management tools had their own ways to deploy scripts but a common denominator of system management and deployment tools for Macs is that they can deploy installer packages. Using payload-free packages allows me to run scripts on managed machines in a consistent manner regardless of which management or deployment tool is being used.